Whether fishing, diving, cruising or kicking back, Matthew and Renee Chambers use their 370 Outrage to the fullest. At first glance, Matthew and Renee Chambers seem a bit suspicious. They spend just a little too much time on the water, in the water and around the water to be normal humans. But rest assured, they do not have hidden fins or gills; they just really love the ocean. And with two Boston Whalers at their disposal for exploring, who could blame them? 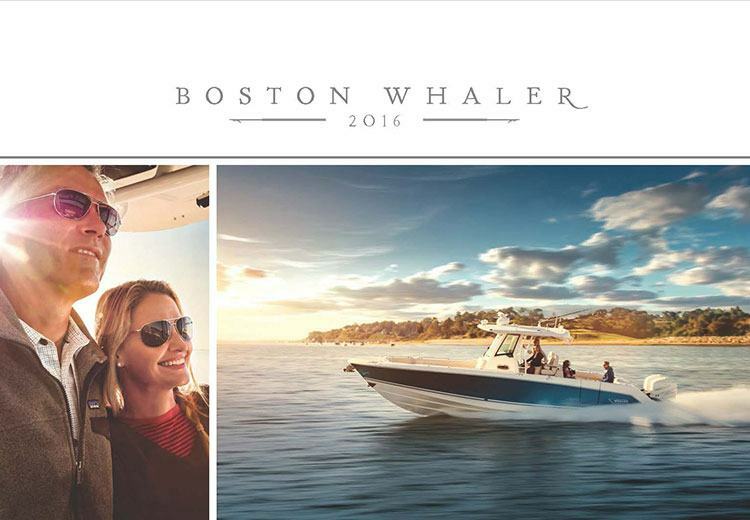 “The fit and finish and the amenities are second to none,” Matthew says of his boats. The Chambers and their friend Captain Steve Papen, a professional kingfish fisherman and owner of Fintastic Inc. Fishing Charters, are preparing to head offshore for the day to catch some acrobatic kings on the couple’s 370 Outrage. Right next to the Outrage—at the family’s waterfront home in St. Petersburg’s Yacht Club Estates—sits their 200 Dauntless, which has the day off. Often it’s tasked with hauling the couple’s paddleboards to inshore locations, pulling one of the Chambers around on a wakeboard, serving as a taxi to waterside restaurants and even going to pick up groceries at a shoreside market across the Intracoastal. Clearly these folks never stray far from the aqua. Matthew and Steve prep the 370 while Renee plays with Tug, the couple’s Portuguese Water Dog. He’s still a pup, but he just graduated “with honors,” as Matthew likes to say, from obedience school. Tug prances around the dock wagging his tail in approval of pretty much everything—the sunshine, the boats and especially his new human parents who treat him like a king. Renee kisses Tug on the nose and proffers a treat before saying goodbye. The pup often gets to join the fun, but since the Chambers are planning a longer day of fishing offshore, Tug will have to wait to sniff out the bounty when they return. Matthew, who has been scuba certified since he was 15 years old, bought the couple’s 370 Outrage to use for spearfishing. “It’s good for getting in and out of the water,” he says. “For diving, it’s the perfect boat.” But the Whaler proved to be good for something else, as well: getting him interested in working the rod and reel. “Fishing is such a social experience,” he explains, “instead of diving and being underwater where you can’t really communicate.” Thanks to friends like Captain Steve, Matthew and Renee have been learning the ropes from the pros, and the sport is coming naturally. First the trio heads about 14 miles offshore from St. Petersburg to the shipping channels. There they target the channel markers for bait like cigar minnows and Spanish sardines using a Sabiki rod. “All those little guys just hit the tiny hooks,” Matthew explains. With the livewell full in less than 20 minutes, they’re ready to get on the kingfish. Captain Steve sets a course trolling back and forth across the shipping channel, and Matthew and Renee offer up the fresh bait with lines off the stern. After catching a few more kings and keeping two big ones to cook up back at the dock, they decide it’s time to target amberjack another 10 miles offshore. Matthew lets Captain Steve take the helm while he canoodles with Renee in the salty breeze. He’s nursing an arm injury, and doesn’t quite have the go-ahead from his doctor to be operating the boat yet. Truth be told, this couple’s collective accident proneness is what brought them together. They actually met at physical therapy. Matthew was in therapy for his neck, and Renee had come in after tearing her meniscus downhill skiing. Matthew overheard Renee telling the tale of her knee’s demise and found the story to be very familiar. That’s when he realized he knew her father—Matthew had heard the story from him—and that he and Renee had met in passing before at a Tampa Bay Rays game. Matthew reintroduced himself, and the two injured athletes began dating. Renee smiles at her husband as he recounts the kismet. She is a speech therapist, and Matthew works in wealth management as the first vice president and senior portfolio manager for UBS Financial Services. Even the name the Chambers chose for their 370 Outrage, Aquanimity, reflects the Whaler reputation. Matthew says they were out for dinner one night and began discussing the boat’s christening. He was Googling synonyms for the word “serenity” and came across the word “equanimity,” which means calm under pressure. As for the 200 Dauntless, although it doesn’t have an official name, the couple’s friends jokingly call it Little Spoon. After snagging a few amberjack and watching the sun dip a little lower in the sky, Renee and Matt pull out their cellphones and wistfully scroll through photos of Tug as if they’d been away from him for a year. As much of a pull as the ocean is for them, it seems the aptly named pup is an even stronger force. Captain Steve points the bow for home, and soon the Chambers are awash in slobbery kisses. The furry little guy licks the dried salt spray from their skin and, as any true Whaler dog would, he even licks the boat.